The Department of Justice signed a contract December 24 to pay $544,000 for an "enhanced profile" and increase its branding on the social networking site "Linked In." The recipient of the contract is Carahsoft Technology Corporation, and you can view the contract details here. Here is DOJ's justification for avoiding the open-bidding process and what it gets for its money. Among the benefits: Full access to every Linked-In profile. 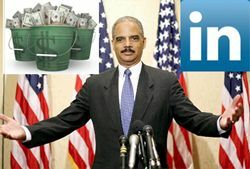 DOJ will be using Linked In to recruit new prosecutors. No surprise here. Attorney General nominee Eric Holder passed the Senate Judicary Committee by a vote of 17 to 2 with only Republican Senators John Cornyn and Tom Coburn voting no. A vote by the full Senate should take place in a few days. Mukasey's term expired on Jan. 20 Bush Deputy AG Mark Filip is <a href="http://politicalticker.blogs.cnn.com/2009/01/21/bush-holdover-takes-the-reigns-awaiting-holder-confirmation/, serving as Acting Attorney General until Holder is confirmed. Next up after Holder's confirmation: The naming of 93 U.S. Attorneys. Will there be any holdovers? Patrick Fitzgerald is expected to stay as Obama previously said he would keep him. The rest will primarily be chosen through recommendations by the Senators in each district. Remember Monica "I didn't mean to" Goodling?